The port side MAN 250kVA generator is the last of the two original 6 cylinder generators that were installed onboard the Ross Revenge. 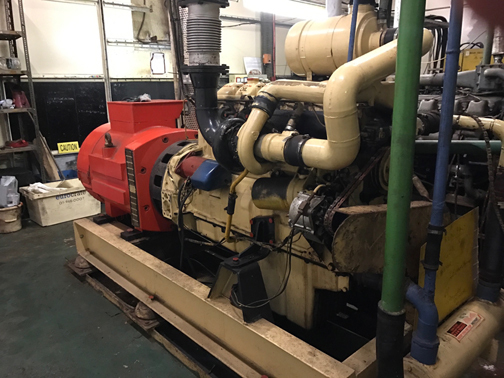 During the broadcasting years at sea it was common for one of these 250kVA generators to be run 24 hours a day for 7 days - at which point the starboard generator would be put online whilst the port side set received a maintenance check over, replacing oil and filters. With a fuel consumption of 25 litres/hour (5 gallons) it is no longer economically viable to have this generator running for the current Ross Revenge / Radio Caroline usage. It is however sevicable and could be connected to the ships electrical distribution network with a minimum of fuss.